AXpact Looks to the Future as it Becomes….DynamicsPact! Home > News > AXpact Looks to the Future as it Becomes….DynamicsPact! AXpact, the renowned Microsoft Dynamics global systems specialist has changed its branding and name to reflect the evolution of the Microsoft product range. “The name and brand, AXpact, came from the fact that we primarily specialised in Microsoft Dynamics AX,” explained CEO, Michael Blatherwick. 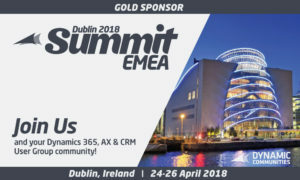 AXpact, which was formed in 2004, will change its name to DynamicsPact from April 2018 and officially launch at the AXUG Conference in Dublin later in the month (April 24-26). The new website is now live, and business continues as usual. DynamicsPact expects demand for its expertise and services to continue to grow as an increasing number of global enterprises, turn to Microsoft Dynamics 365, to manage their business operations. “Our experience in delivering expert, international Microsoft Dynamics projects across various countries, languages, and cultures, is second to none. There has never been a more exciting time to be working with Microsoft and delivering solutions which make a positive impact on our client’s operations and their bottom line!” concluded Blatherwick.